Despite having established daily beauty routines, 79% of women are open to trying new beauty brands. As part of the POPSUGAR Insights Q2 2014 beauty study, we asked women to describe what specifically would tempt them to try new beauty products. 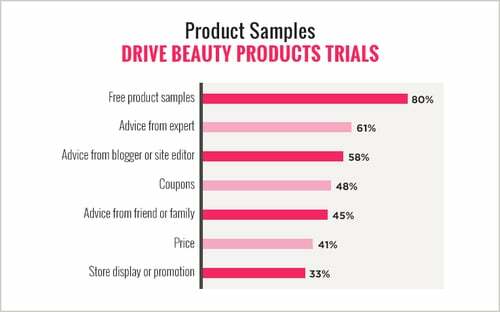 Overall, 80% of women said that free product samples would tempt them the most. Having the ability to physically hold the product is obviously a key factor in getting women to make a switch. Proving the importance of category expertise, advice from an expert (61%) was the second most popular way to get women to trial. This was followed by advice from either a blogger or site editor (58%). If brands cannot offer free product samples, couponing might be an effective strategy. Forty-eight percent of women indicated that offering a coupon would tempt them to try a new product. Less than 50% of women said that advice from friends or family (45%), product price (41%), or a store display or promotion (33%) would tempt them to try a new beauty product.